Hello all! Just a pre-warning, there are pictures of hairy legs in this post! Well, okay, just 1/2 of a picture, but it had to be done! Influenster sent me Veet's new EasyWax Kit to try. I have been a leg-waxer for years now. I have tried every brand imaginable and the only brand that has worked for me is Nads. I usually buy the Nads strips, but I haven't been able to find them recently so I have the Nads gel and that works okay. When Influenster surveyed me about a new wax product, I was thrilled! I didn't know it would be Veet until I received it, but I can say that I've used Veet's strips before and did not like them. I was willing to give this kit a try. So, this waxing product is supposed to be easy peasy. It's a self warming electrical roll-on kit. One con to this is you have to have it plugged in. Depending on where you like to wax your legs, this could be a problem. I usually wax in my polish room and I have a plug right by where I sit. Here is everything that comes in the kit. So the first thing you have to do is insert the wax refill into the warmer, re-cap it, and plug it in for 30 minutes. This gives it time to heat up the entire cartridge and give you an interruption-free waxing experience. At first glance, it doesn't look like there is enough wax to pull up anything. Well, it's enough. There were some swipes that I went over once more giving me 2 layers of wax, but I'd say that it wasn't completely necessary. On average, I use 3 strips [of any brand] on each leg. This was the same with the Veet Kit. I was also able to re-use the wax after the initial application. This helped with any stray hairs left behind. So, compared to other waxing products I have used in the past, it's great. It is better than Veet's wax strips but equal to the Nads wax strips and Nads gel. It's also better than Nair's wax strips....is there one more brand I'm missing? Probably, but this EasyWax Kit is better than that, too! I would give this a 4 out of 5 on my scale just because it still left a few strays, which is what most at-home wax kits will do. It also depends on your hair and how long/thick it is. 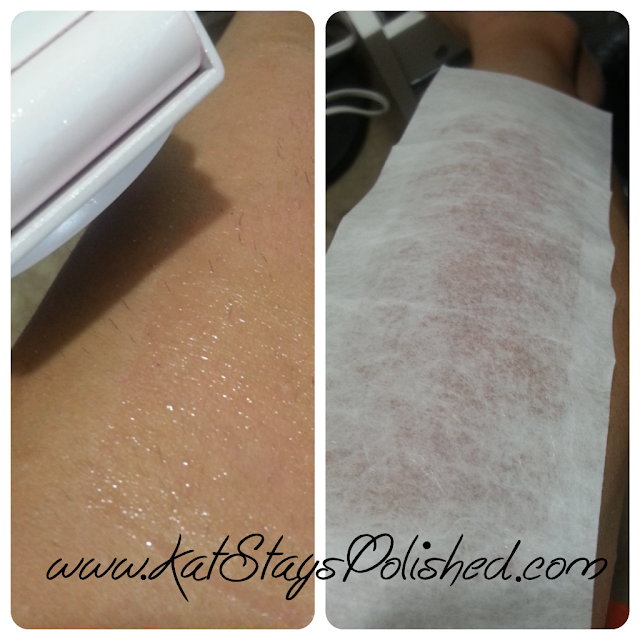 Check out my freshly waxed leg using the Veet EasyWax Kit! I'm not sure of the places you can buy this--I assume your local drugstore, Target, or Walmart. The price may vary but Veet has a $2 on their Facebook Page if you want to try this. More info on this kit HERE. Thanks for checking out my wax post! I hope you learned something about a new product. See you next time!